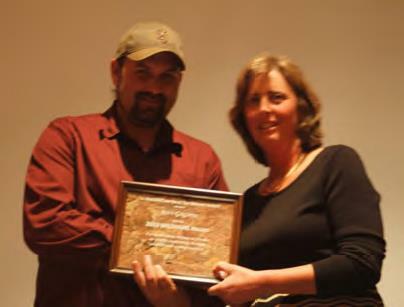 The Arizona Chapter recognizes outstanding accomplishments in wildlife management, both by professionals and laymen, by bestowing awards at each year’s Joint Annual Meeting (Pinetop, AZ, February 6-8, 2014). We encourage our members to nominate deserving people or organizations for the awards, and as has been the case in the past, our chapter was privileged this year to receive numerous nominations for well-deserving individuals working in the wildlife management field. Below are summaries of each award, the awardee, and the outstanding achievements for which we awarded them (in the words of the nominators, in some cases). 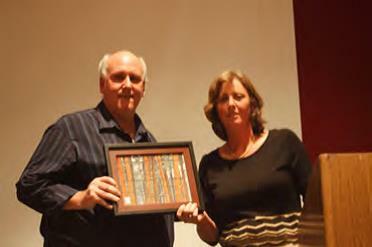 The Doug Morrison Award is given in memory of Doug Morrison, the Chapter’s former President and U.S. Forest Service Biologist. 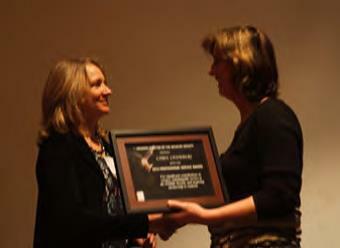 The Award exemplifies the dedicated work ethic of Morrison, and is given to an Arizona biologist in a non-supervisory position who has made significant contributions to the management and conservation of wildlife in Arizona. Contributions are in areas of wildlife research, education and training, management, or law enforcement. 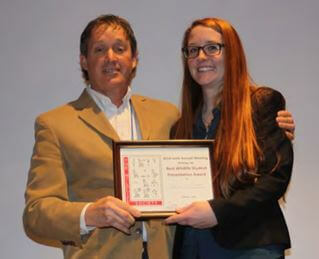 The 2013 Doug Morrison Award was presented to Erika Nowak (U.S. Geological Survey and Northern Arizona University), for her substantial contributions to our understanding of Arizona’s herpetofauna, and engagement of students and the public in better under- standing, accepting, and enjoying Arizona’s wildlife resources. Erika’s current research includes work on Northern Mexican and narrow-headed gartersnakes, herp surveys at Petrified Forest National Park, and a long-term rattlesnake study at Tuzigoot National Monument. Each of these projects seeks to not only further our understanding of these lesser-known species, but also to engage the public. People from all walks of life have volunteered to assist on her projects, many of whom have never handled herps before, or are even afraid of them. Through her patience and knowledge, Erika is able to inspire interest and have her volunteers (and the public) overcome fears and misconceptions. When asked about Erika’s herpetology class at NAU, her students talk about how impossibly hard the class is, but praise Erika for the same reason. The Professional Service Award is given to an Arizona biologist for outstanding contributions to management and conservation of wildlife. This individual is also recognized for their professional work standards and conduct. Contributions are in the areas of wildlife research, education and training, management, conservation, or law enforcement. The 2013 Professional Service Award was presented to two very deserving recipients this year: Carol Chambers (Northern Arizona University) and John Koprowski (University of Arizona). One of Carol’s nominators described Carol’s dedication to service as “indefatigable.” Indeed, serving as the Southwest Section TWS representative, Carol travels extensively throughout the section and works extremely hard to increase the visibility and effectiveness at the Section level of TWS. She has been instrumental in helping new student chapters get underway, while maintaining strong support for existing chapters. Carol reaches out to students, encouraging them to act and ask questions on their own while providing guidance and instruction. Carol has developed two and taught six undergraduate classes, and developed three and taught five different graduate classes. She’s been an advisor for 29 Master’s students, and three PhD students. Her students have made over 60 presentations at professional conferences. Carol is also a prolific and well-respected scientist. She has published 44 journal articles, eight conference proceedings, seven book chapters, and edited a book. As Director of the Mt. Graham Biological Programs for the University of Arizona, John has taken the Mt. Graham Red Squirrel Monitoring Program from an adequate monitoring project to an outstanding monitoring and research program, ensuring that the research is coordinated with state and fed- eral agencies, the university, and the public, while also ensuring compliance with state and federal laws. John has also served as Director of the Desert Southwest Cooperative Eco- system Studies Unit, where he executed and provided collaborative research, education, and technical assistance addressing desert ecosystem resource issues at local, regional, na- tional, and international levels on over 100 federally funded projects throughout 5 US states and northwestern Mexico. Internationally, John has been an invited lecturer in China and Japan, and co-taught a 3-week field course on desert ecology to Mongolian students in the Greater Gobi Desert. John is also a nationally recognized expert on squirrels. He has served as a technical editor or co-author of three books and is working on another one; co-authored 14 book chapters; close to 100 peer reviewed journal articles, proceedings, and technical reports; and has 17 technical articles in progress. He accomplishes all this while also teaching and advising several masters and PhD graduate students. John has been active in AZTWS, and is a strong supporter of student involvement in TWS at both the National and local level. 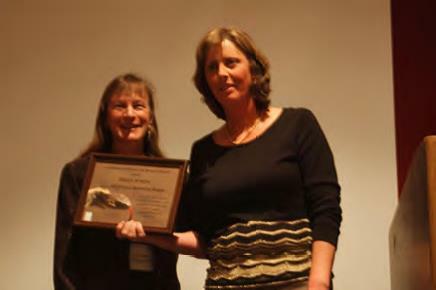 The WILDHARE Award is given to a professional wildlife biologist in Arizona for their contribution to understanding or applying habitat principles to management of an animal species or group of species. We awarded two well-deserving 2013 WILDHARE recipients: Scott Sprague and Jeff Gagnon (both with the Arizona Game and Fish Department’s Highways Research Program). Scott has worked extensively on a broad range of wildlife connectivity and habitat projects and research, including elk and pronghorn movements near high-traffic highways, and highway permeability assessments along Interstate 17, and Highways 89 and 260. This significant and important research focuses on maintaining habitat, habitat connectivity, and the health of wildlife populations. His dedication to his research is accompanied by his passion for engaging people in conservation. Scott works hard to inform and engage the public, including people of all ages, about the importance of maintaining wildlife connectivity across highways, and the challenges that transportation infrastructure can pose for wildlife. He regularly provides presentations for children, government bodies, and conservation organizations. Over the last decade, Jeff has been an integral part of over a dozen wildlife-highways projects that have made Arizona a leader in the field of road ecology. With several manuscripts published that have become part of the foundation of elk and deer management practices relative to roadways, Jeff has come to be recognized as an international expert on the relationships between wild ungulates and our transportation infrastructure. A key member of the flagship State Route 260 project from the beginning, Jeff took the helm of AGFD’s Highways research program almost 5 years ago. Under his leadership the highways program has continued to grow and remains a shining example of success for the Department. With Jeff at the helm, the U.S. Highway 93 bighorn sheep project has garnered international attention and numerous awards. The premiere road ecology conference was hosted by Arizona this year. Neither the designation of host state nor the success of the conference would have been possible without Jeff’s essential contributions. The Roger Hungerford Award is given to a student who, while attending an Arizona college or university, made significant contributions to the management and conservation of Arizona’s wildlife and/or habitat. Contributions are in the areas of wildlife research, education and training, management, conservation, or law enforcement. 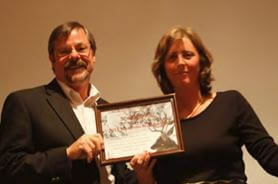 The Award is given in memory of one of Arizona’s finest re- search biologists, Roger Hungerford. 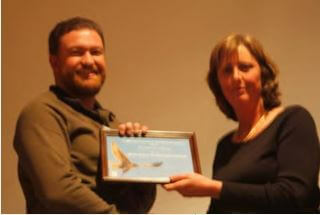 The 2013 Roger Hungerford Student Award was presented to Jonathan Hicks of Scottsdale Community College this year. Jonathan is a Marine veteran who is returning to school to prepare for a career in wildlife management. He is currently President of the SCC Student Chapter of The Wildlife Society. Jonathan has shown out- standing leadership in The Wildlife Society taking charge of getting things organized and making things happen. His great ambition is to be a Wildlife Manager. Jonathan worked a summer internship with AGFD surveying reptiles in the desert areas near Yuma. He showed great independence and perseverance working in the heat and got the job done. He also is great with people, as he is always positive and upbeat, and supports others’ efforts. He is always the first to volunteer to help others out, and has volunteered on a number of AGFD activities: prairie dog transplants and habitat renovation, pronghorn collar recovery in the Agua Fria grasslands (where over $30,000 in collars were recovered), among others. He has shown outstanding leadership on all SCC field trips and activities, always being the first one to jump in and get things done. Jonathan currently works at Ben Avery Shooting Facility as a Range Safety Officer. He is great with guns and is eager to share his knowledge with others. One of Jonathan’s nominators says “Jon will be a great hire for any agency that is looking for an outstanding can-do man to get things done”. 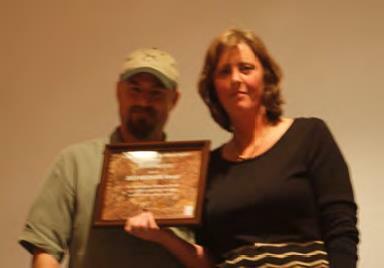 The recipient of the Scrapping Bear Award has gone beyond the normal call of duty in support of wildlife issues and has made exceptional contributions toward the management and protection of wildlife and habitat resources AND the recipient has stood up for what they thought was right, even if it was controversial or perceived as contrary to their agency’s official position, supervisor’s positions, or had the potential to put the recipients job on the line. The recipient does not have to be a member of the Arizona Chapter. 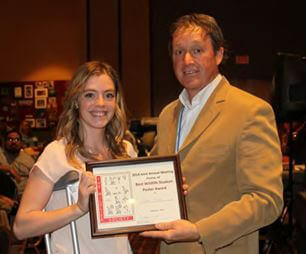 The 2013 Scrapping Bear Award went to Norris Dodd of the Arizona Department of Transportation this year. Like a true Scrapping Bear awardee, Norris “doesn’t hold back”. Through his career at the Arizona Game and Fish Department, he ruffled some feathers and even got himself transferred. In his subsequent position he continued to tell it like it is, but in the meantime he helped create the Department’s Highways research group that has become an international leader in Road Ecology research. After retiring from the Department, Norris stayed involved with wildlife-highway projects working with AZTEC as a consultant. In the spring of 2013, he was hired by ADOT as their resident expert of wildlife connectivity. Since being hired on, Norris has made it his mission to incorporate wildlife connectivity consideration into ADOT’s standard practices by developing agency policy. Although he has met substantial resistance, he continues pushing forward eager to overcome this new challenge. A Best Student Poster/Paper Certificate is awarded at the Joint Annual Meeting following evaluation by a three-member panel of referees. Both undergraduate and graduate students are eligible from both states and will have their presentations judged under six major categories; organization, audience involvement, delivery, knowledge of subject, use of visuals, and content. AZ and NM chapters of TWS compete together for the best wildlife presentation and poster awards. Genetic relatedness among maternal colonies of big brown bats (Eptesicus fuscus) in Flagstaff: im- plications for disease transmission. Reaction of coyotes (Canis latrans) to a variety of olfactory stimuli from interspecific carnivores.